Around 745, Water Chenla (水真臘, Cambodia) undoubtedly had attacked the capital of Srivijaya, and occupied Chaiya and Nakhon Si Thammarat. At the same time, the control of the Malacca Straits temporarily collapsed. However, nearly twenty years later, the Srivijaya group counter attacked Chenla and recovered Chaiya area. This event had not been explicitly recorded in any historical inscriptions or some other evidence, so it is a missing link. However, some serious events had certainly happened around this region. The Ligor inscription dated in 755 and the sudden emergence of Śailendra suggest us a series of the unusual events. This is the most important point to see the history of Śrivijaya. If Śrivijaya (Shi-li-fo-shi) was located at Palembang, there could not be a justifiable reason why Srivijaya suddenly ceased sending embassies after 742 and in 768 Śailendra (new Kha-ling) emerged as a tributary state instead of Śrivijaya to the Tang Court. Water Chenla had probably attacked and occupied around 745. Water Chenla sent mission to Tang in 750, but Srivijaya group counter attacked Water Chenla around 760 and retrieved Chaiya. At that time the main force of Srivijaya group was Sailendra navy. And Śailendra became the champion state of the Śrivijaya group. The king of Sailendra, Panangkaran （Panamkaran） was later assigned ‘Maharaja’ of Srivijaya group. However, for many historians, the hypothesis that Chenla had attacked Chaiya and occupied there must be unacceptable. The reason is very simple because, as they suppose, Srivijaya (Shi-li-fo-shi) was located at Palembang, so Chenla could not have attacked Srivijaya. At the same time they cannot find the reason why Shi-li-fo-shi (室利佛逝) disappeared from the chronicles of the Tang Dynasty after 742. In 768, Śailendra appeared under the name of ‘Kha-ling (訶陵)’ in the Tang chronicles. For many historians the nature of Śailendra is not clear, so they have continued long discussion, and conclude that San-fo-chi was dominated by Śailendra. This is not a correct answer at all. My discussion is that Śailendra had belonged to the Srivijayas after they had attacked the central Jawa, the commander Dapunta Selendra (Śailendra) became the king of Sailendra in 686. Later Water Chenla attacked Chaiya and Srivijaya group counter attacked Water Chenla at the Bay of Ban Don. The main navy player, Sailendra king Panangkaran was given the title of ‘Mahārāja’ of Srivijaya, and thereafter Sailendra became the leader of Srivijaya group. After the victory, Srivijaya group, led by Panangkaran proceeded to the Mekong River and occupied major ports of Chenla. Around 770, Srivijaya sent big army to Cambodia to occupy the territory of Chenla, of which commander was Jayavarman II. He was probably a prince of Srivijaya’s royal family member. 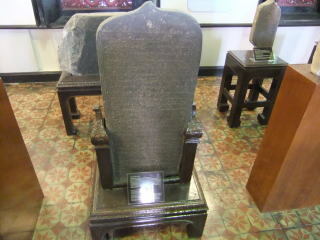 The victory monument of revenge war at Chaiya is ‘Ligor inscription’ dated 775. Thus Śailendra became the champion state of the Srivijaya group, but curiously Śailendra sent envoys to the Tang Court under the name of ‘Kha-ling (訶陵）’same as former Sañjaya’s. This seems quite mysterious for us. Of course there was a reason why Śailendra must use the name of ‘Kha-ling (Ho-ling), because the Tang Dynasty had never allowed conflict or quarrel among the tributary states. In China, the emperor’s subordinates were not allowed to fight each other. However the actual shipment of Śailendra’s tribute to China had been mostly dispatched from the east coast of the Malay Peninsula, probably Sathing Phra, because where was the most convenient place to gather commodities from the Srivijaya group. Around 820, after Mahārāja Samaratuńga died, probably the second Mahārāja of Śailendra, his daughter Prāmodāwardhanī might have succeeded him as‘Queen’, but she had married with Sanjaya prince Rakai Pikatan. As the result Samaratunga’s son Prince Bālaputra had lost helm in the central Jawa and the kingship of Śailendra. Later Bālaputra was defeated by Rakai Pikatan (Sañjaya prince), husband of Prāmodāwardhanī and was exiled from Java. Rakai Pikatan assumed the kingship in 838, so Bālaputra might have left Jawa before that. At that time unity of Srivijaya once collapsed, and Jambi sent envoys to Tang independently in 852 and 871. However, Jambi probably had realized a single state could not make big profit, and at the end of the 9th century, big three states of Srivijaya group established a new polity, ‘San-fo-chi（三佛斉）. San-fo-chi means three vijayas, namely Chaiya, Kedah and Jambi. Chaiya and Tambralinga took care of the Gulf of Thailand and the east region. Kedah took care of the north end of the Malacca Straits and Jambi the south end of the Straits. Around 830, Prince Bālaputra fled to Suwarnadvipa (Sumatra and the Malay Peninsula) but he inherited the title of Mahārāja of Srivijaya. His final destination was probably Kedah. Jambi had already the strongest economic power among Srivijaya group and the kingship was also unshakable, so Bālaputra seemed to go to Kedah. He also, probably became the ruler of Chaiya, old Shi-li-fo-shi, and he possibly added some words behind the back of Ligor inscription (face B). , Ligor inscription was found at first at Chaiya then removed to Ligor (Nakhon Si Thammarat), in the 13th century by Chandrabhanu, king of Tambralinga after collapse of Srivijaya group.so it is called ‘Ligor inscription’. “The inscription A begins with eulogy of Sri-Vijayendra-raja, and then refer to the building of three brick temples for Buddhist gods by Sri-Vijayesvarabhupati. Jayanta, the royal priest (Rajasthavira), being ordered by the king, built three stupas. After Jayanta’s death, his disciple and successor Adhimukhti built two brick caityas by the side of the three caityas (built by the king). In conclusion, it is said, that Srivijayanrpati, who resembled Devendra, built the stupas here in Saka 697 (775 AD). Three ‘stupas’ mean ‘Wat Wieng, Wat Long and Wat Kaeo. Remains of Wat Long and Wat Kaeo are seen at Chaiya, near Wat Wieng. Ligor A inscription tell about a Srivijayan king named Dharmasetu, the Maharaja, who built the Trisamaya caitya for Kajara. Dharmasetu’s daughter princess Tara was said to be queen of Maharaja Samaratunga, son of Maharaja Panangkaran. While the Ligor B inscription, dated 775 CE, contains the information about a king named Vishnu who holds the title Sri Maharaja, from Śailendravamśa hailed as Śesavvārimadavimathana (the slayer of arrogant enemies without any trace), who should be the commander of Sailenrdra navy, king Panagkaran. Panangkaran was assigned of Maharaja of Srivijaya, by Dharmasetu. There are some different interpretations regarding the king mentioned in Ligor B inscription; some suggest that the king mentioned in this inscription was King Panangkaran while other argues that it was his successor, King Samaratunga(Samaragravira). However, B inscription probably was written by Balaputra around 830s. Anyway, this inscription suggests there was a fierce battle in this area (with Water Chenla army), and many soldiers were killed. The ‘Kota Kapur’ inscription of the Bangka Island dated 686 noticed that Srivijaya force would attack the Jawa Island, where Kha-ling kingdom had reigned. 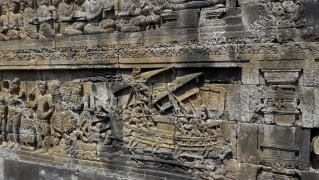 Srivijaya’s navy directly attacked and occupied Pekalongan area. The Sojomerto inscription is a symbol of the victory monument of Srivijaya force. Pekalongan was the major port of the central Jawa. In the Ling wei Tai-ta (嶺外代答)' published in 1178, by Chou Ch'u-fei(周去非) wrote that She-Po(闍婆國) other name is Pekalongan(莆家龍). 「闍婆國，又名莆家龍，在海東南」. However, at least before the Tang Dynasty era, the concept of ‘Java (She-po闍婆)’, had been included the Malay Peninsula. In the early 5th century, high Buddhist priest Gnavarman (求那跋摩) said to have visited ‘Java’, but in his case he could not have visited the Jawa Island, because before the 5th century, Buddhism was not so popular there. He must have visited Ban Ban state of the Malay Peninsula where Mahayana Buddhism had flourished already, and its king was a devotee of Buddhism. On the other hand, in the Java Island, the infrastructure of Buddhism was very scarce. Even a single ancient Buddha footprint did not exist there. The Srivijaya Army defeated and captured the capital of central Javanese Sanjaya kingdom (Kha-ling) in 686. However, Sailendra had not demolished the Sanjaya kingship. Both kingships had co-existed. The dual kingships (parallel kingship) continued. If Srivijaya completely occupied the central Jawa, someday the Tang Dynasty would notice the fact, and Sriviijaya should be penalized by the Tang Court. So, Srivijaya pretended the old Kha-ling unchanged as if nothing had happened. Srivijaya's purpose was to secure the major port of Jawa and monopolize the tribute to Tang. Srivijaya’s strategy was to ‘monopolize’ the tributary trade with China, and had no intention to dominate the rural areas of the Java Island to get the surplus agricultural products from farmers. It is because, traditionally Funan and Srivijaya had no administrative officials belonging to the kingdom. So Sailendra could not dominate whole Jawa from the beginning. 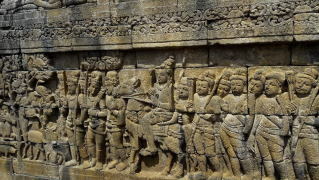 As the result, Sanjaya continued the administration of inland Jawa and Sanjaya accumulated wealth and the real political power and finally kicked out Sailendra from Jawa after the death of Maharaja Samaratunga around 830. Sailendra was satisfied with monopolizing the international trade and navy. 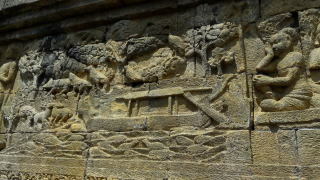 The Kota Kapur inscription of the Bangka Island, wrote that Srivijaya wanted to attack the island of Java because they refused to obey Srivijaya’s policy on the tributary trade. Coedès said that Srivijaya army went to attack the ‘west Jawa’, not the central Java. In the west Java there was Taruma (多羅摩，or 堕婆登=Duo-po-deng),which sent tributary mission in 647. (Coedès, English, 1968, p83) Coedès misunderstood Tarama was a major competitor for Srivijaya. Srivijaya’s rival was Kha-ling (訶陵）located in the central Jawa and not Taruma, in ‘west Jawa’. Kha-ling had sent the tributary missions many times in 640, 647, 648 and 666 and stopped suddenly after 666. Why Coedès avoided Kha-ling, it is because Coedès thought Funan had fled to the central Jawa from the Mekong Delta in the middle of the 6th century. So, Srivijaya had no reason to attack Kha-ling. Duo-po-deng in the west Jawa was a small country and could not be Srivijaya’s rival. Coedès says: “The inscription of Bangka closes by mentioning the departure of an expedition against the unsubdued land of Java in 686. The land referred to may have been the ancient kingdom of Taruma, on the other side of the Sunda Strait, which we do not have spoken again after its embassy to China in 666-69.” (Coedès, English, 1968, p83). However the last mission of Duo-po-deng (堕婆登=Taruma?) was in 647. Here again Coedès made mistake or told a lie. Kha-ling sent the next tributary mission in 768, after 100 years’ interval. This Kha-ling is apparently ‘Sailendra (Srivijata)’. If Duo-po-deng was Taruma as Coedès says, it was not a strong rival for Srivijaya. In the history of the Angkor Dynasty, the founder is Jayavarman II, who came to Cambodia from ‘Java’, but where was Java? M. Vickery says that Java is ‘Cham’ i.e. the ‘Linyi’ (Champa). In addition, M. Vickery thinks Sailendra (Dapunta Selendra) was originally a Javanese king and Sailendra has nothing to with Funan. This is because he is ignoring the historical development and establishment of Srivijaya. The ‘Kota Kapur’ inscription of the Bangka Island dated 686 noticed that Srivijaya force would attack the Jawa Island, where Kha-ling kingdom had reigned. 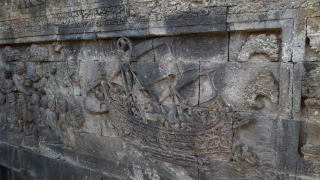 Srivijaya’s navy directly attacked and occupied Pekalongan area. The Sojomerto inscription is a symbol of the victory monument of Srivijaya force. In the Ling wei Tai-ta (嶺外代答)' published in 1178, by Chou Ch'u-fei(周去非) wrote that She-Po(闍婆國) other name is Pekalongan(莆家龍). 「闍婆國，又名莆家龍，在海東南」. Before this text, in many cases She-po (Jawa闍婆) meant the Malay Peninsula or the Malay Archipelago. However, at least before the Tang Dynasty era, the concept of ‘Java (She-po闍婆)’, had been included the Malay Peninsula. In the early 5th century, high Buddhist priest Gnavarman (求那跋摩) said to have visited ‘Java’, but in his case he could not have visited the Jawa Island, because before the 5th century, Buddhism was not so popular there. He must have visited Ban Ban state of the Malay Peninsula where Mahayana Buddhism had flourished already, and its king was a devotee of Buddhism. On the other hand, in the Java Island, the infrastructure of Buddhism was very scarce. Even a single ancient Buddha footprint did not exist there. The Srivijaya Army defeated and captured the central Javanese Sanjaya kingdom (Kha-ling) in 686. However, Sailendra had not demolished the Sanjaya kingship. Both kingships had co-existed. The dual kingships (parallel kingship) continued. Srivijaya’s strategy was to ‘monopolize’ the tributary trade with China, and had no intention to dominate the rural areas of the Java Island to get the surplus agricultural products from farmers. In the central Jawa Island, Sailendra seems to handle international trade and navy and Sanjaya to manage the domestic administration. However, Sailendra sent the tributary mission under the name of ‘Kha-ling’. Kha-ling is divided into ‘early’ and ‘latter’. Early Kha-ling was Sanjaya and ‘Latter (new) Kha-ling’ was Sailendra. Many historians do not understand the difference of the Kha-ling’s tribute missions between Sanjaya and Sailendra. Kha-ling of Sanajaya’s mission stopped after 666 and Sailendra’s Kha-ling started tribute mission in 768. Sailendra started the tributary mission sinse 768. Because Sailendra was given authority to send mission to China, representing Srivijaya Group, after the victory of war against Water Chenla at the Bay of Ban Don and the king of Sailendra (Panamkaran) had been given the tytle of ‘Maharaja’ of Srivijaya. Before that Sailendra used to be one of subordinate states of Srivijaya. Sailendra Kha-ling had broader business basis, because which was representing the whole Srivijaya group. And its shipping port was changed to Sathing Phra (north of Songkhla) in the Malay Peninsula. Sanjaya Kha-ling was limited its business base within the central Jawa and its shipping port was Pekalongan. Most historians do not understand this change. For instance, Yumio Sakurai, Emeritus Professor of University of Tokyo and say that Srivijaya’s tributary trade had been limited very small and Srivijaya’s contribution to the Tang Dynasty was only Buddhism. (Southeast Asian history course Iwanami Vol No. 1, p143). This is miserable mistake. The presence of Srivijaya to the Tang Court was so big. Srivijaya stopped sending envoy after 742, Sailendra (New Kha-ling) succeeded Srivijaya’s business. In the Song times, San-fo-chi succeeded Sailendra business. In the central Jawa Island, Sailendra handle international trade and navy. Sailendra’s Kha-ling started tribute mission in 768. In 686 Srivijaya occupied Kha-ling of Sanjaya, so Sanjaya group could not have sent its mission. Srivijaya Group, after the victory of war against Water Chenla at the Bay of Ban Don and the king of Sailendra (Panamkaran) had been given the tytle of ‘Maharaja’ of Srivijaya, Sailendra became the champion of Srivijaya group. Before that Sailendra used to be one of subordinate states of Srivijaya. Kha-ling is divided into ‘early’ and ‘latter’. Early Kha-ling was Sanjaya and ‘Latter (new) Kha-ling’ was Sailendra. Many historians do not understand the difference or ignore this fact. Sailendra Kha-ling’s shipping port was changed to Sathing Phra (north of Songkhla) in the Malay Peninsula. Because collecting tributary goods to China, Sathhing Phra was the most convenient port. Formerly, Sanjaya Kha-ling was limited its business base within the central Jawa and its shipping port was Pekalongan. King Panamkaran, after he returned to the central Java, he unified the Jawa island to the Śailendra kingdom. Because he was assigned to Mahārāja of Srivijaya. Mahārāja Panankaran had stripped of ‘the delegacy’ of the Sanjaya (former Kha-ling) royal family which had been a co-ruler of the central Java for nearly 100 years. The Śailendra Dynasty constructed the biggest Mahayanist Buddhism temple in the world, the ‘Borobudur temple’, as the commemoration of the great victory over Chenla. At that time, probably there were not so many Buddhists in Jawa. Buddhism might be widely introduced after the occupation by Srivijaya in 686. 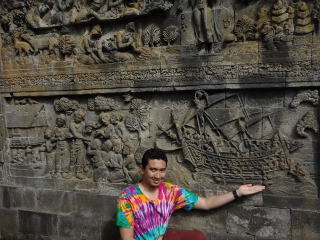 However, the Sanjaya group, too, constructed the ‘Prambanan Siva temple’ in the middle of the 9th century after Rakai Pikatan had kicked out Prince Balaputra from Jawa (The Shiva-grha epitaph of 856). There is an opinion that the Borobudur temple had been naturally buried by the eruption of the ‘Merabi volcano’, but it is difficult to believe. 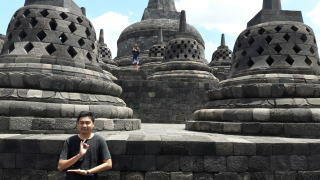 The Borobudur temple, possibly had been buried with earth by Sanjaya, as the result it could have fortunately survived under the earth. Thanks to it, it will be possible to say that a state of good preservation had been maintained until the staff of Sir Stanford Raffles discovered it in the 19th century. Both are the historic evidence how Śailendra and Sanjaya had co-existed near Jogjakarta since 686 until around 830. Around 830, Crown Prince Balaputra of Śailendra was defeated at war, by Rakai Pikatan, prince of the Sanjaya family, and husband of Balaputra’s elder sister, princess Pramodhawardhani. Soon after the death of their father Mahārāja Samaratungga, the battle had started between Sailendra and Sanjaya. As the result, Balaputra was defeated and was driven out of the Jawa island around 830 and the Śailendra kingdom in the Jawa island disappeared forever. The military activity of Sailendra must be remembered that during 760~830, Sailendra led Srivijaya’s expansion to Cambodia. After defeating ‘Water Chenla’ at Chaiya region, Sailendra navy proceeded to the Mekong Delta, and next to the sea-shore of Indochina, the territory of Linyi. Sailendra navy probably destroyed the export facilities (including big merchant ships) of Linyi. So, Linyi had to stopped sending the tributary mission to Tang after 750. After invading to Cambodia, Srivijaya group tried to kick out the Chenla kingdom and established new polity, the Angkor Dynasty. This story is told later in the Chaper 4 “The Angkor Dynasty”. ‘New Kha-ling’ sent its first tribute mission to Tang in 768, Śailendra navy should have secured the Mekong Delta River mouth before 768. The story that Srivijaya broke into the Mekong River and invaded the coastal capital, killing the King, had prevailed among the Arab merchants, and an Arab scholar, Sulaiman wrote the similar story in 851. An ambitious Chenla King was anxious to attack the Mahārāja of Srivijaya, but the Mahārāja knew beforehand his intention and attacked Chenla. The Chenla king was beheaded by the Srivijaya army and his head was retuurned to the prince of Chenla king. Who was the Chenla king? Q. Wales suggests that was Mahipativarman. However, he stayed throne during 780-788. King Sumbhuvarman reigned during 730-760, so he might be a killed king. But I cannot confirm his existance. Who were the kings of water Chenka, after Queen Jayadevi? There is no record. The new king of the Angkor Kingdom, Jayavarman II was a king from Srivijaya group. Without doubt, he was strongly supported by the Sailendra navy. Angkor Kingdom had been under control of Srivijaya group for nearly 300 years.